How the Columban Mission began . At 3 0′ clock a knock came at Fr Blowick’s door. The Bishops wanted to see him. The three priests looked at each other and wondered was this the end.Nervously Fr Blowick followed the messenger across the square and into the board room. At the head of the table sat Cardinal Logue. On his right was the Archbishop of Dublin, Dr Walsh, but between the two stood a vacant chair. There Fr Blowick was invited to sit down. The Cardinal questioned him about the project. Then he was asked to leave. The two founders were almost beside themselves with excitement. That same week they produced a mission pamphlet and had 35,000 printed. “It was ready by Friday night and my head was ready for the surgeon,” said Fr Blowick. He set up an office in Dublin to deal with correspondence. At weekends he joined the others making appeals. They were a little band of five and could not possibly reach every parish in the country. Professors at Maynooth and All Hallows College, Redemptorists, Passionists, and ‘, Dominicans – all joined in the work. Many priests appealed in their own parishes. The whole nation seemed I to throw itself behind the enterprise. China in 1924 to be Spiritual Director and chaplain. 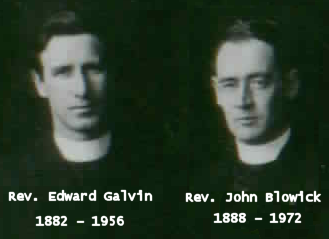 the Columbans.He was made a bishop in 1927 . Expelled from China in 1952. Columbans with Edward Galvin in 1916. Founded the Columban Sisters in 1922.
and was incardinated in Liverpool Archdiocese. house arrest by the Japanese during WW2. first Columban film “The Cross and the Dragon”. Council.He went to St.Columbans , Nebraska to teach in 1931.
the U.S. and was rector of the Seminary from 1940 to 1947.
bandits in China , on 28 February 1931. He was 58 years old. bandits and killed.He is buried in China. and went to China in 1920 but returned to Kilmore diocese in 1923.
last surviving member of the first team to go to China. and had to leave in 1922.
in 1920.He returned to the US in 1922 due to ill health. 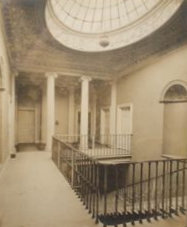 On January 29th, 1918, 19 young students gathered for their first night in the drawing room of an old Georgian building in a remote spot on the borders of Galway and Mayo called Dalgan Park. There, in the flickering light of a few candles, Fr John Heneghan read an extract from Christ’s prayer for his apostles. 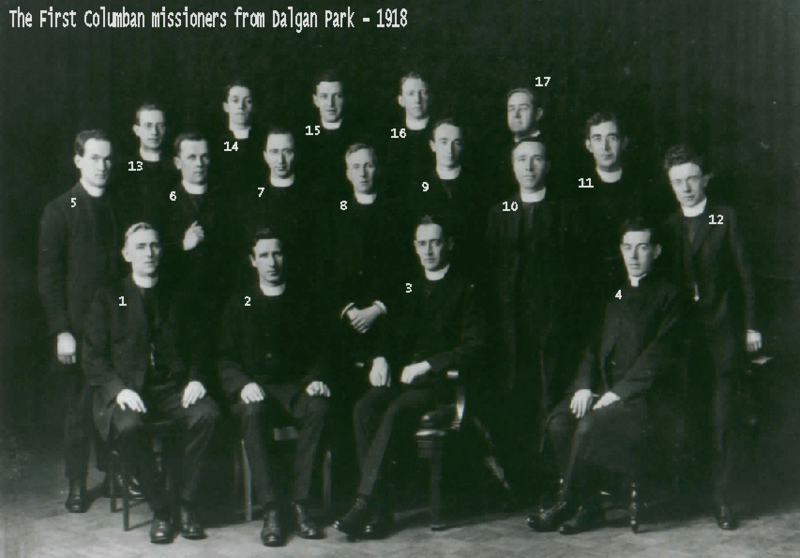 On June 29th, 1918, the Maynooth Mission under the title Society of St Columban was officially erected by the Bishop of Galway as a society of secular priests.Eventually, on March 19th 1920, the first band of twenty Columbans left Dalgan for China headed by Frs Galvin and Blowick. Invited by the Shrule ParishCommunity, eleven Columbans returned to the site of the Old Dalgan for what turned out to be an historic and memorable occasion on Sunday September 15. 2002. Nothing remains of the main building, but the memory and spirit of the local people was as obviously genuinely true as it was tangible. 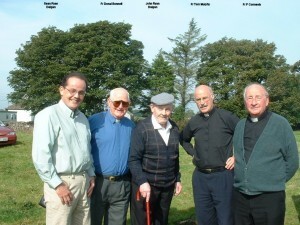 The eleven Columbans were warmly welcomed back to where we had started in 1918 and departed in 1941. After a light lunch we were brought to the site of the Old Dalgan, where a temporary notice board contained maps and photographs of the Old Dalgan, and a printed list of all the Columbans who were ordained there. Thoughfully three golf buggies were an hand to transport those who needed a lift to the still surviving ball alleys, the old tomb and on down to the Black river. The Davins and Sheridan families who occupy the well kept two surviving buildings, in the area known as Bobbio where formerly the ordained 4th divines lived extended an obviously heartfelt welcome, interspersed with tears, emotions sandwiches tea, and brandy. to the visiting Columbans , in particular to the four of our group who had studied in the Old Dalgan: Tommy Comerford, Michael Donoghue, Oliver Whyte and Paddy Connelly. Paddy Sheridan had built a beautiful grotto of Our Lady which the Columbans were requested to bless.We invited the Sheridan clan to join us in blessing the grotto with holy water. 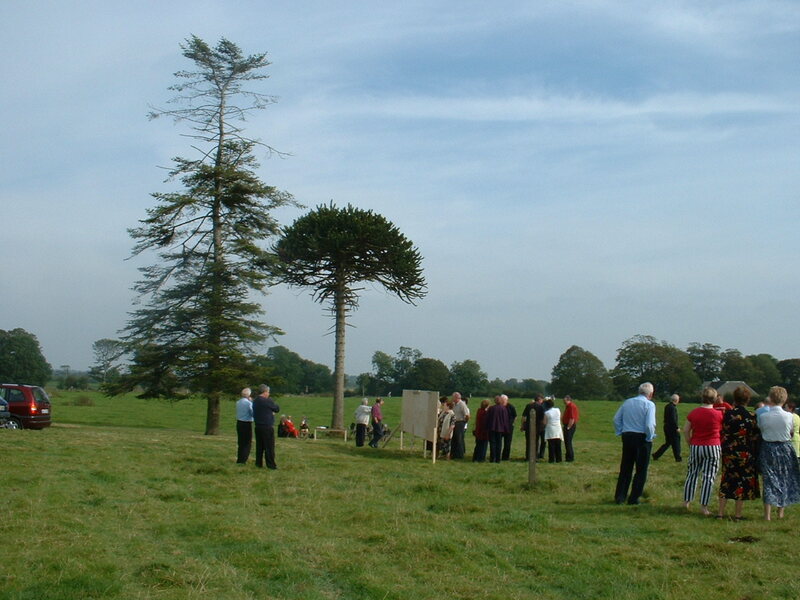 Back under the famous ‘Monkey tree’, directly behind the now non-existent main Old Dalgan Building, we celebrated Mass with a crowd of a few hundred people, who had gathered for, what was clearly for them, an emotional and historic occasion.Some of the participants were people who had worked in the Old Dalgan . I met three people who, in 1941,had moved up to work in the new Dalgan in Meath for a few years to help in the transition. Many of the participants were the children or relatives of those who worked in the Old Dalgan, and who were proud to be associated with their ancestors involvement in the Columbian project. Some had returned from England for the event. There was a particuarly poignant moment when it was observed that Mrs, Teresa Blowick a sister-in-law of John Blowick was present, sitting quietly in the congregation in the middle of an open and normally deserted field , invited by the local parish priest, Fr: Michael Crosby. His brother Ned Crosby, worked as an associate priest with us in Peru.All were invited back for an evening meal in the parish hall. Many of us Columbans felt overcome and embarrassed at the amazing welcome extended to us by this local community who had never forgotten us but who may have been forgotten by us Columbans in the new Dalgan. Fr.Martin Murphy , Fr. Donal Bennett , Fr. Tom Murphy. , Fr. Oliver White . 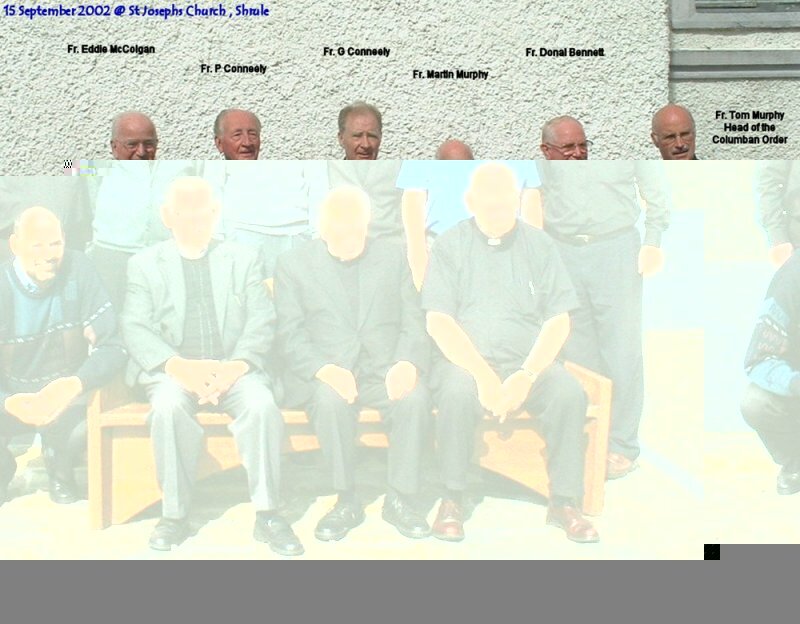 Invited by the Shrule Parish Community, eleven Columbans returned to the site of the Old Dalgan for what turned out to be an historic and memorable occasion on Sunday September 15. 2002 in particular to the four of the group who had studied in the Old Dalgan: Tommy Comerford, Michael Donoghue, Oliver Whyte and Paddy Connelly. Nothing remains of the main building, but the memory and spirit of the local people was as obviously genuinely true as it was tangible. Denis if a grand nephew of Fr william O Flynn of Ringabella, there are various family members who may have material relating to him. I am not related to him but have his memorial card as my grandmother and grand aunts knew him well. Smyth. Tour guide Fr Smyth?? 1994. I remember the day the Dalgan Park building was destroyed, dear mother cried. I am trying to find information about Archbishop Patrick Cronin. He was born in 1913 and ordained priest in December 1937. I believe he attended Dalgan Park. In 1938 he went to the Philippines and worked on the missions for many years. He died in 1991.